Van rentals, convertibles, luxury cars, SUVs and sports cars are some of the most popular & highly rented categories at the Chicago O’Hare International Airport. Rent a car for Chicago O’Hare International Airport in just three quick steps - search, compare, reserve! Cancel your Chicago O’Hare International Airport car rental for free, up to 48 hours before the pickup time. Whether you are in Chicago on business or on vacation, our Chicago O’Hare International Airport car rental service wants you to have a stress and worry free time while you are here. Our Chicago O’Hare International Airport(ORD) car hire service ensures that you have peace of mind, comfort and freedom to do what you choose and go where you choose. We offer wide range of Chicago O’Hare International Airport car rental inclusive like collision damage waiver, roadside assistance, theft protection, liability insurance, unlimited mileage, reliable customer support and more. Located around 28 km from downtown Chicago, Chicago O’Hare International Airport is one of the busiest airports not only in the Unites States but globally as well. Besides being chosen as the “Best Airport in North America” 7 years consecutively, Chicago O’Hare International Airport boasts 7 runways, 182 gates and 4 passenger terminals out of which 55 Airline carriers function, the biggest and those with most flights being United Airlines, American Airlines and United Express. More than any other airport, Chicago O’Hare International Airport connects more cities all across the globe. Chicago O’Hare International Airport has 2 Cargo areas. Getting to the airport is easy enough – public transport, taxi service or Chicago O’Hare International Airport car rental. Chicago O’Hare International Airport is easily accessible from the city. Chicago O’Hare International Airport has also adopted the ever popular “People Mover” Airport Transit System (ATS) for easy movement within the airport and its terminals – It connects all passenger terminals, gates as well as parking lots. Rent a car at Chicago O’Hare International Airport from us is the easiest and cheapest method to explore all the attractive destinations around the airport and the city. Chicago O’Hare International Airport has a number of impressive eateries as well as beverage stalls and the baggage claim area is pretty close to the terminal exit which is convenient. As far as shopping is concerned, there are a good many retail outlets where you can get your dose of retail therapy. Emergency and wheelchair services are also available, as is parking which is available on different levels. Wi-Fi service at Chicago O’Hare International Airport is not free and is available on a pay-per-day usage basis. Chicago Midway Intl. Airport – Route I-294S and I-55N will direct you to Chicago Midway Airport which is 31mi away. General Mitchell International Airport – I-94W highway will lead you to this airport located at a distance of about 72.3mi from ORD Airport. Fort Wayne Intl. Airport – Follow I-90E & U.S 30 E route to reach Fort Wayne Airport, which is 182mi from ORD Airport. South Bend Regional Airport – Follow I-90E to reach South Bend Airport which is 108mi from ORD Airport. Giordano’s This is a great place for enjoying pizza in Chicago. 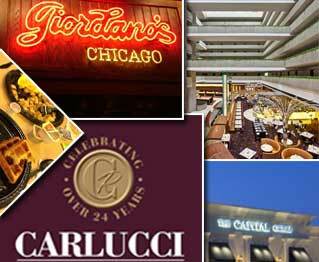 Carlucci Rosemont Offers public seating and private rooms for conducting events. The Capital Grille This fine- dining restaurant offers great cuisines and an elegant atmosphere to guests. Ram Restaurant and Brewery Great place for enjoying food and drinks.